Finally, I had a bit of sunlight coming through my window so I could get a good picture of this sheet. These colors are difficult to photograph, but I’ve done my best, and they seem pretty true to color to me. Iroshizuku Fuyu-Gaki. This is a red-orange, but there is something coral/pink about it in my eyes. I like it very much. Noodler’s Dragon’s Napalm. What a fun color! I don’t know what I’d use it for, but it is visually appealing. Definitely a Pink-Orange color. 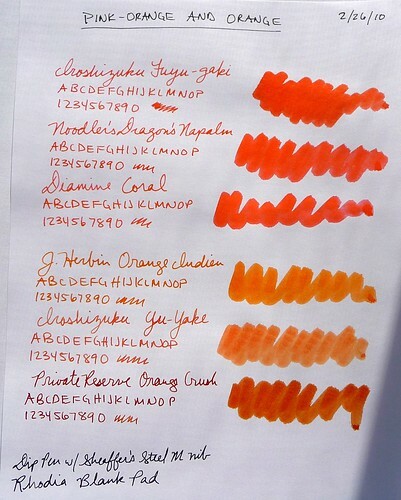 Diamine Coral. This is surprisingly similar to Dragon’s Napalm. It is, however, a bit more orange. Still quite a nice pink orange. JH Orange Indien. This is one of my favorite oranges. Seems a straight orange to me. Very little red. Iroshizuku Yu-Yake. This has a little more red to it than Orange Indien. It does not photograph well here. Quite a lovely orange. Private Reserve Orange Crush. I think my bottle may be turning a bit, which is a problem with this ink. It was a bit more orange several years ago, now it’s an orange-brown sort of color. I still like it though. Nice comparison. I have three of these oranges (at one time 4) and I have no idea why. I love the color and concept of these inks but rarely fill a pen with any. So, I love orange but never use it…am I crazy?